It is not a secret that moving around gets a bit harder as we get older. If you are building a timber frame home to spend your retirement, whether you plan to retire tomorrow or in twenty years, forethought and preparation for the physical changes that occur in later in life will allow you to enjoy your timber home for longer. One of the major obstacles in homes is stairs. They can be difficult to get up or down, especially if you have to carry something. While you can retrofit stairs with lifts, it is easy to eliminate stairs altogether during the design process. If you have all the aspects of a home you need for day-to-day living on the same level (entry, bedroom & bathroom, kitchen, and laundry), stairs become obsolete. Containing your layout on a single level can be a smart choice. However, large ranch-style homes may not be feasible due to your property size or your budget. 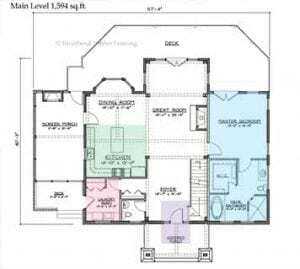 In these cases, there are practical reasons for including a basement or second floor. Basements can give you the square footage you need for guest rooms, an office, or game room. They also work well on sloped sites and are a cost-effective way to gain the space you need. Second floors are another great way to add square footage for a hobby room, bunk room, or storage. Since timber frames have naturally vaulted spaces, you can carve a loft into the space that is already in your home’s design. If a basement or second floor is primarily used for something you will not need to visit on a regular basis, then these spaces are great additions for your retirement home. Stairs are an obvious and predictable pain point in a home; however, you might consider planning for the unexpected too. While we do not imagine ourselves using a walker or wheelchair, the longer we live in our home the more likely we or a loved one may need special accommodations. To avoid costly renovations down the line, you may choose to design your home according to universal design principles. Universal design is a concept of creating buildings that are accessible to all people, regardless of their mobility. Creating wider doorways and hallways is one of the most popular practices of universal design. The wider width can better accommodate wheelchairs but are also handy for navigating through with a large laundry basket. A timber frame home’s strong structure makes openness one of its inherent properties. Since many timber frame homes do not require the use of interior load-bearing walls, it is easy to create spaces where anyone can maneuver. appliances and environmental controls at central heights to limit bending down or reaching up. While planning for future health challenges may be uncomfortable, these design elements are a must have for retirement living. Building a timber frame home for retirement, or secondary home that will become a primary residence, is common among Riverbend’s clients. 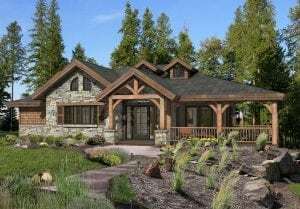 Visit our selection of floor plans perfect for retirement to learn how you can adjust a timber frame home’s layout so you can live in it for many years to come.